A worthy addition to the Port Mourant canon. A magnificent, excellently rich and fruity full-proof rum. 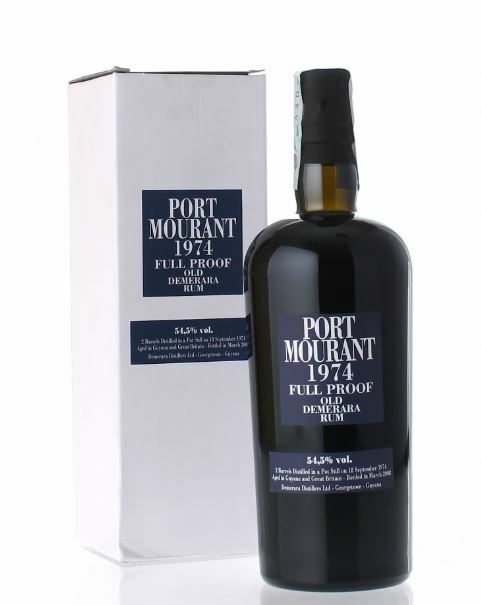 Allowances should be made for my personal palate: I do believe that rum deriving from the Port Mourant still in Guyana may be among the very best available, largely because the distillate runs through the only wooden still in the world. This provides the rum with a depth of flavour and richness that I have consistently scored high in all its iterations: Berry Brothers & Rudd 1975, the El Dorado 21 and 25 (PM forms part of the blend), Bristol Spirits PM 1980 and Rum Nation’s Demerara 1989 are examples (and I think Wood’s Navy rum has some PM lurking in there, as well as some Enmore, but never mind). Velier, much like other European rum bottlers, hews to a rather starkly minimalist ethos in presentation, similar across the range (though nowhere near the aggressive consistency of SMWS’s offerings in their camo green). An opaque, black bottle with variations across the line only coming from the label design. “Menacing”, I wrote in my Albion 1994 review, and I haven’t seen much since then to change my mind about that…these things look like they want to assault you with a nail studded club. By now, anyone who has read my or others’ reviews of Velier products will know that they don’t muck around with standard strength 40% offerings, but give you a massive pelvic thrust of proofage that has sheep in Scotland running for cover: this one is no different, if milder, being bottled at 54.5%, which is almost weak by Velier’s standards. That strength impacts the deep and heavy nose in stunningly searing fashion: there were immediate notes of licorice and dark chopped fruits (lots of raisins there) ready for a West Indian black cake, cherries and ripening mangoes, intermingled with lighter floral notes, all held together with honey and crushed walnuts. Strength and subtlety in the same sniff. The ruby-brown (or amber-red, take your pick) rum was dark and thick in the glass, like a boiled down soup of brown sugar. It was full bodied, spicy, syrupy, even a shade salty, hinting somewhat of maple syrup. Backing that up came wave upon wave of molasses, apples, citrus rind, prunes, sultana grapes. The rum turned a shade dry in the mouth, and continued to pump out notes of caramel, toffee, and the faint resinous aftertaste of black cardamon. Man this was quite something – it showcased what rums were back in the day. I thought that the BBR PM 1975 might be the oldest and perhaps best rum of this particular still I’d ever see, but this baby, in my opinion, is as good or better, which I attribute mostly to its increased strength. The finish was lovely as well, though a tad on the spicy side: lingering notes of sweet molasses, citrus, and even here some of that heaviness persisted into a long finish that made the entire experience one to savour. A recent comment on this site (in the Bundie review) made the rather startling statement that “Rum in general is not meant to be sipped neat, like a Whisky or a Scotch.” Naturally, I rebutted that, and, in writing this review, offer the Velier PM 1974 as proof positive that here is a rum which it makes no sense to drink any other way. Take it neat or don’t take it at all. You can of course mix it, but I – and I’ll go out on a limb and speak for the makers – simply don’t get the point. This is a rum to luxuriate in, to treasure…and to mourn once it’s gone. 364 bottles made from two barrels, aged between September 1974 and March 2008. I’m going to be conservative and call it a 33 year old. I tried the PM 1974 blind in conjunction with several other rums so as not to permit my natural enthusiasm for the vintage to cloud my scoring judgement. I’m still as miserly with my scoring as before, of course, and tried to put the brakes on scoring high just because it was what it was. But guys, gals…this thing is enormously impressive, it’s a brilliant rum, and deserves what from me is a very high rating. Thank’s for another great review Lance. I’m still searching for the PM 74, but was fortunate enough to get a sample of the 75′ from a friend ( and also tasted it in Berlin during the rum fest a few weeks ago), amazing stuff! Cyril, you mentioned to me earlier, that the PM 74′ and 75′ had been matured in Europe rather than in the tropics, does any of you know when they were brought to europe? Glad you liked it, Gregers. I think it’s awesome, of course. According to Luca, the ’74 and ’75 were indeed partially matured in Europe. Would be interesting to know where in Europe and for how long. Btw, if only I’d known you were in Berlin as well a few weeks back. Would have been a pleasure to meet you. Same here. But I’m hoping to make the RumFest (either in Berlin and the UK) an annual event, so there’s always hope for next year. It’s the only way I can put together enough tasting notes to keep writing, given the scarcity in my current location. Disregarding the history of the magnificent rum and seeing how this one scores approximately the same as the other Veliers, is this one really worth the hefty price tag? I’d say yes, Henrik, but that’s just me. I paid the same for this rum as I did for the UF30E, and twice as much for the Skeldon 1973. Still, as I’ve remarked before, at these price levels, value and quality do diverge, and you’re buying more than just the taste. It’s up to the individual consumer to decide whether the intangible aspect of the rum is worth the extra coin. For me…yeah, it did. For you, probably not. Which is why I’m happy to send samples around the place to people ho really show the interest. Found a Velier PM 1975 not long ago – but at 360 euros I decided not to get it.